Draft: 2005, Minnesota Twins, 1st rd. Is married.....wife's name is Serina.....the couple has six children...Graduated from Washington Union (CA) High School, where he also played football...Attended Fresno State University, where he was named Most Outstanding Pitcher and Second Team All-Western Athletic Conference in 2004 and WAC Pitcher of the Year and First Team All-WAC in 2005...Created "Brush 'Em Back 22" in 2009, a foundation that helps raise money to help fight child abuse.....the Foundation holds baseball clinics at his old high school...His father, Rudy, is a Sergeant Major in the Army and has served a tour of duty in Afghanistan...His younger brother, Michael, coaches high school baseball in Fresno ...Enjoys cartoons, fantasy football and spending time with his kid. Went 6-8 with a 4.51 ERA in 19 starts...The Brewers went 9-10 in his starts...Produced 7 quality starts, going 4-0 with a 2.49 ERA in those starts (43.1ip, 12er)...Began the season on the 15-day disabled list with a right lat strain after he was injured during his final start of Spring Training on 4/1 at Houston.....transferred to the 60-day DL on 4/28...Was reinstated from the disabled list on 6/14 after making 3 rehab starts at Class-A Wisconsin. Went 6-14 with a 5.63 ERA in 26 games, including 25 starts…The Brewers went 9-16 in his starts…Produced 10 quality starts, going 4-3 with a 2.37 ERA in those starts (64.2ip, 17er)…Made his only relief appearance of the season (fourth of his career) on 5/31 vs. Arizona and earned a 7-6, 17-inning victory (5ip, 3h, 0r, 2ibb, 1k)…Was on the 15-day disabled list from 7/6-7/20 with right shoulder tendinitis, retroactive to 7/3…Was removed from the starting rotation after his 9/5 start and did not pitch again in 2015. Went 10-6 with a 3.82 ERA in 24 starts between Chicago-NL and Texas...Produced 11 quality starts, going 8-0 with a 1.46 ERA in those starts (80ip, 13er)...From 6/21-7/24 had a career-high 6-game winning streak over 6 starts, posting a 1.23 ERA during this stretch (44ip, 6er)...Began the season on the 15-day disabled list with a strained left latissimus dorsi muscle.....was placed on the disabled list on 3/31, retroactive to 3/22...Was reinstated from the disabled list on 5/21 after rehab starts at Double-A Tennessee (2g) and Triple-A Iowa (2g).....made his season debut on 5/21 at Pittsburgh (ND)...Went 6-1 with a 3.17 ERA in 11 starts with Chicago, including 5-0 with a 1.24 ERA over his last 6 starts, all quality starts (43.2ip, 6er)...Produced 7 quality starts with the Cubs.....the team went 8-3 in his starts...Recorded a season-high 10 strikeouts over 7.0 innings in a 7-2 win on 6/27 at Milwaukee...Was traded to Texas on 7/22 in exchange for INF Mike Olt, RHP C.J. Edwards, RHP Justin Grimm and a player to be named (RHP Neil Ramirez on 8/23)...Went 4-5 with a 4.38 ERA in 13 starts with Texas...Produced 4 quality starts with the Rangers.....the team went 8-5 in his starts...Made his Rangers debut in a 3-1 win on 7/24 vs. New York-AL (7.1ip, 5h, 1r, 0er, 0bb, 5k)...Tossed his only complete game of the season in a 4-2 loss on 8/3 at Oakland.....was his first loss as a Ranger (8ip, 8h, 4r, 4er, 1bb, 5k, 1hr)...Signed as a free agent with Milwaukee on 1/26/14. Matt went 5-7 with a 3.91 ERA (45 ER/103.2 IP) in 18 starts for Chicago ... missed the last two months of the season with a stress reaction in his right elbow - was placed on the 15-day disabled list, August 7 (retroactive to July 28), and transferred to the 60-day D.L., August 21...Went 3-1 with a 2.12 ERA (11 ER/46.2 IP) in seven home starts ... was 2-6 with a 5.37 ERA (34 ER/57.0 IP) in 11 road starts....His season ended having gone 18-straight home starts with three or fewer earned runs allowed dating to June 27, 2011 ... that's the longest stretch for a Cubs starting pitcher since Kerry Wood went 22-straight home starts having allowed three or fewer earned runs from 2000-02....Has a 1.97 ERA (28 ER/127.2 IP) in his last 18 home starts....The Cubs scored three or fewer runs while he was on the mound in 13 of his 18 starts....Held the opponent to a .236 batting average (90-for-382), including a .224 mark (43-for-192) by right-handed hitters....Struck out 96 batters in 103.2 innings of work ... walked just 32....Recorded a career-high five-game winning streak dating to 2011 thanks to his first victory of the season, April 12 vs. Milwaukee, in which he tossed 8.2 shutout innings before he was pulled following 119 pitches....Committed three errors and logged an .842 fielding percentage (19 TC)....Was 2-1 with a 2.67 ERA (10 ER/33.2 IP) in five April starts, but was 0-2 with a 6.86 ERA (15 ER/19.2 IP) in four May outings....Recorded quality starts in his first two outings to begin a campaign for the first time since 2010, when he began with three-straight quality efforts for Tampa Bay....Struck out 10 Phillies, April 29 in Philadelphia ... was his 10th career double-digit strikeout effort....Earned his first win of the season, April 12 vs. the Brewers, tossing 8.2 shutout innings in the 8-0 victory ... allowed just three hits and two walks while striking out nine....Tossed 7.0 innings of shutout baseball in Philadelphia, April 29, as the Cubs topped the Phillies, 5-1 ... allowed one hit and one walk while fanning 10....Punched out 10 in a game for the 10th time in his career....Left July 21's start in St. Louis after 3.0 scoreless innings due to a stress reaction in his right elbow. In his first season with Chicago, Matt went 10-10 with a 3.32 ERA (73 ER/198.0 IP), 197 strikeouts and 63 walks in 31 starts...he was sidelined, May 18-June 6, with a right elbow bone contusion...Recorded his third-career 10-win campaign including his secondstraight...Threw two complete games: a 1-0 setback, July 2 vs. the White Sox anda 7-1 win, September 21 vs. Milwaukee...His 8.95 strikeouts per 9.0 innings pitched ranked seventh in the SeniorCircuit and 10th among major league pitchers...Left with the lead but did not factor in the decision seven times...allowed three runs in three starts (21.0 IP), July 14-24, receivingno-decisions in all three games...Allowed 17 unearned runs, tied for third-most in the majors...Boasted a 2.45 ERA (28 ER/103.0 IP) in 15 starts following the Mid-Summer Classic, the seventh-best ERA among starting pitchers in themajors...posted a 4.26 ERA (45 ER/95.0 IP) in 16 starts prior to theAll-Star break...Finished the season riding a career-high tying four-game winning streak...went 4-0 with a 2.14 ERA (11 ER/46.1 IP) in his final six starts,dating to August 30...Allowed 14 home runs in 198.0 innings pitched, good for an average of0.64 home runs per 9.0 innings pitched...that ranked eighth-best inthe N.L. and 10th in the majors (min. 190.0 IP)...Went 6-5 with a 3.07 ERA (39 ER/114.1 IP) when pitching on four daysrest (18 starts)...was 4-5 with a 3.66 ERA (34 ER/83.2 IP) with five ormore days rest (13 starts)...Went 4-5 with a 4.56 ERA (32 ER/81.0 IP) in 14 road starts, includinga 3-0 mark with a 2.48 ERA (9 ER/32.2 IP) in his final five road outings...Produced a 2.46 ERA (32 ER/117.0 IP) with a 6-5 record in 17 startsat Wrigley Field...went 6-3 with a 2.25 ERA (23 ER/92.0 IP) in his last13 home starts since May 11, including a 1.67 ERA (7 ER/37.2 IP) inhis last five...Went 9-6 with a 2.46 ERA (44 ER/160.2 IP) when tossing 6.0 or moreinnings (23 starts)...went 7-1 with a 1.87 ERA (22 ER/106.0 IP) whentossing 7.0 or more frames (14 starts)...Fanned a career-high 12 batters in his Cubs debut, April 3 vs. Pittsburgh...the 12 strikeouts were the most all-time in a Cubs debut, eclipsingthe previous mark of 10 (done four times, last by Thomas Diamond in2010)...Went 1-1 with a 2.53 ERA (6 ER/21.1 IP), 17 strikeouts, three walksand a .176 average against (13-for-74) in his three starts (one completegame), June 21-July 2...Was unbeaten in five September starts, going 3-0 with a monthly-best2.04 ERA (9 ER/39.2 IP), 34 strikeouts, nine walks and a .211 averageagainst...Earned his first win as a Cub in Chicago's 5-3 victory, April 30 in Arizona...tossed 8.0 innings of three-run, six-hit ball, while walking two andfanning 10. In his final season with the Rays, Matt set career marks with 15 victories and 204.2 innings pitched ... he threw the first nohitterin franchise annals, July 26 vs. Detroit ... the 15 wins were second-most in franchise history (David Price, 19 in 2010). ... His 15 victories were tied for 10th in the A.L. ... Held opponents to a .197 batting average with runners in scoringposition, fourth-lowest in the A.L. ... Allowed 28 homers, fourth-most in the A.L ... threw 12 wild pitches, tied forfifth-most in the AL. ... Did not allow a run in the first inning in 17-straight starts from June 24-September 25 ... was the second-longest streak of its kind in 2010,trailing only San Diego's Mat Latos (22 starts). ... Recorded seven starts of at least 8.0 innings pitched while allowing tworuns or less, tied for sixth-most in the AL. ... Began the season 3-0 with a 0.75 ERA (2 ER/24.0 IP) in his first threestarts ... became the first hurler to begin a season with three starts of atleast 8.0 innings having allowed one earned run or less since Curt Schillingin 1998.w Was the first A.L. pitcher to turn the trick since eventual Cy Youngwinner, Roger Clemens, in 1991. ... Was the fastest in Rays history to reach five wins, May 5 at Seattle (27thteam game). ... His three complete games ranked tied for eighth in the A.L. ... besides theno-hitter, had two 8.0-inning complete game losses (May 21 at Houstonand August 6 at Toronto). ... On July 7 vs. Boston, recorded his first career save, two days after a 3.0-inning start vs. the Red Sox. ... Endured the shortest start of his career, June 18 at Florida, going 1.1innings (seven runs allowed). ... Named A.L. co-Player of the Week, July 26-August 1, the week of hisno-hitter.w The no-hitter began a stretch in which he went 4-2 with a 1.59ERA (10 ER/56.2 IP) in eight starts through September 3. ... Went 4-1 in April, tying Andy Sonnanstine (2008) for most wins in April inRays history. ... August 22 at Oakland, beat Dallas Braden, 3-2 ... just the second time in19 years two pitchers faced each other after throwing no-hitters earlier inthe year.w Prior to the July 28 matchup of Philadelphia's Roy Halladay andArizona's Edwin Jackson, had previously happened September 6,1991, when the White Sox Wilson Alvarez faced Texas' NolanRyan. ... Made a NLDS Game Three start against the Rangers and received a nodecisiondespite holding Texas to one run in 6.0 innings in an evental 6-3Tampa Bay victory. Twenty-five-year-old set career bests in starts(32), innings pitched (203) and strikeouts(189)...also established career highs with 79walks and 25 home runs allowed....His 189 strikeouts were 9th in the AL and 2ndmost in club history behind Scott Kazmir's 239in 2007...tied for 5th in the AL with 8.4 strikeoutsper 9 innings....Reached the 200-inning mark for the first timein his career...joined James Shields as thesecond pair of Rays starters to log that manyframes in one season (also Shields and ScottKazmir in 2007)...went 6 or more innings 21times, and 7 or more innings 15 times....Held opponents to a .233 avg., 4th best in theAmerican League...held left-handed hittersto a .196 avg., the lowest of any right-handedstarter in the majors...in fact, this was the lowestof any RH starter (min. 400 BF) since SF JasonSchmidt (.191) in 2004 and by an AL rightysince BOS Pedro Martinez (.150) in 2000....Averaged 106.9 pitches per game, tied for 4thmost in the majors...was responsible for 10 ofthe 12 highest pitch counts by a Rays pitcheron the season (120-4x, 118, 117-2x, 116-3x)....Led the staff with 19 quality starts, but theRays went 15-17 in his 32 starts....Received the lowest run support in the AL at3.68 runs per 9 innings, despite the Rays ranking7th in the majors in runs scored.Of the 17 AL starters with ... an ERA under 4.00,he was the only one with a losing record...ofthe 42 in the majors with an ERA under 4.00,only Garza and WAS John Lannan (9-13, 3.88)had losing records....Allowed 3 earned runs or less in 23 starts, including21 of his last 28....Tied TOR Ricky Romero for 2nd-most walks inAL behind NYY A.J. Burnett (97)...hit 11 batters,tied for 2nd most in the AL....Was 6-3 against the AL East in 2009 with a2.35 ERA (111-IP, 29-ER)...went 2-9, 5.97 (92-IP, 61-ER) against everyone else...lifetime is18-9, 2.77 (243.1-IP, 75-ER) against the Eastand 9-25, 5.09 vs. everyone else including2-15 against the AL Central....Picked up his 7th win on July 24 at TOR, 4-2over Roy Halladay in 10 innings...pitched aseason-high 9 innings...Evan Longoria brokea 2-2 tie with a 2-run double in the top of the10th...matchup marked just the 2nd time inthe last 9 seasons both starting pitchers went9 or more innings and struck out 9 or more(Halladay and Randy Johnson did it April 29,2005 at Yankee Stadium)....After that start, won only one more game therest of the season (12 starts)...his 4-0 combinedshutout Sep 19 vs. TOR ended a careerlongwinless streak of 9 starts...matched hisseason high with 10 strikeouts in the game andalso walked a career-high 6.Went 3-1 vs. Toronto with a 1.27 ERA (28.1-IP,4-ER)...as a Ray is 6-2 with a 0.92 ERA vs. Toronto(66.1-IP, 48-H, 6-R/ER, 19-BB, 54-SO)...further, has surrendered just one earned runin 4 starts at Tropicana Field (27.2-IP), a 0.33ERA...his overall career 1.70 ERA (69-IP, 13-ER) is the lowest all time against the Jays....Won his season debut April 9 at BOS, 4-3 overDaisuke Matsuzaka...gave the Rays their firstseason-opening series win since 2002 and consecutiveregular season series victories at FenwayPark (after going 25 straight without one)....The next time he faced Boston, April 30 athome, he tossed 6 perfect innings until JacobyEllsbury's infield single to lead off the 7th...wasthe longest bid for a perfect game in Rays history,and set a club record by retiring 18 battersin order...tied for the 3rd-longest no-hitbid in club history...struck out a season-high10 and walked only 1...Rays won it 13-0 andhe and Grant Balfour combined on a 1-hitter....Is the Rays all-time leader (min. 300 IP) with a3.83 ERA and .238 opp avg. Twenty-four-year-old spent his first full seasonin the majors after being acquired November28, 2007 from the Twins along with Jason Bartlettin a trade involving Delmon Young...withScott Kazmir on the disabled list, he began theyear as the Rays No. 2 starter behind JamesShields and made his first Opening Day roster...went 11-9 with a 3.70 ERA over 30 starts,despite spending 16 games on the DL with radialnerve irritation in April.Garza and James Shields were the only 2pitchers in MLB to throw 2 complete gamesallowing 2 hits or less in 2008.Held opponents to a .245 mark, ranking 9thamong AL pitchers and tops among qualifyingRays starters.Went 7-4 against the AL East with a 2.54 ERA(95.2-IP, 27-ER) in 15 starts...included was a3-2 record with a 0.47 ERA (38.0-IP, 2-ER) in5 starts against the Blue Jays...only BOS JonLester (2.48) had a lower ERA against the ALEast in 2008.Hurled 2 shutouts, tying the club record, andtied with several others for the AL lead...only 2ML pitchers had more shutouts: CLE/MIL CCSabathia (5) and MIL Ben Sheets (3).Threw 3 CG, which ranked tied for 3rd in theAL...included was a 1-hitter and a 2-hit shutout...Rays had 7 CG as a team, as Shields alsotossed 3 and Sonnanstine the other...only 4major league pitchers had more CG: CLE/MILCC Sabathia (10), TOR Roy Halladay (9), MILBen Sheets (5) and CLE Cliff Lee (4).Went 4-1 in May with a 2.52 ERA (39.1-IP, 11-ER) in 6 starts...the 4 wins would have tied aclub record for most in any single month, butKazmir notched 5 wins that same month to seta new club mark.On June 26 at FLA, tossed his first careercomplete game, a one-hitter...9.0-IP, 1-H,1-R/ER, 1-BB, 10-SO...until Hanley Ramirez'sleadoff HR in the 7th, he had allowed no hitsand faced the minimum 18 batters...faced 28batters, tying Shields' club record for fewestBF in a 9-inning CG effort (May 9 vs. LAA)...10SO matched his season high (May 28 vs. TEX),matched the club's season high, and fell oneshy of his career-high 11 (July 29, 2007 at CLEwhile with MIN).Hurled both his shutouts in a span of 4 starts...the first came July 29 at TOR a 3-0 win overRoy Halladay as he totaled 9.0-IP, 5-H, 1-BB,5-SO...was his 2nd win over Halladay, the firstcoming 10 days prior, July 19 at home...becamethe 4th pitcher to beat Halladay twice ina season, joining BOS Pedro Martinez (2004),BAL Pat Rapp (2000) and BOS Tim Wakefield(2007)...the only others to beat Halladay eventwice in a career were NYY Roger Clemensand TEX Vicente Padilla.Fired a complete-game, two-hit shutoutAug 15 at TEX to defeat Kevin Millwood...struck out 9, walked 2, and threw a career-high119 pitches (78 strikes)...Rays won 7-0.Started the home opener on April 8 vs. Seattleand Erik Bedard...left that game withradial nerve irritation in the 3rd inning (trailing3-1)...placed on the DL April 9-25, missing 16games.His control improved throughout the year...allowed2.50 BB/9 IP (39-BB, 140.1-IP) over hisfinal 22 starts from May 28 on...issued 4.06BB/9 IP over his first 8 starts (20-BB, 44.2-IP).Went 7-3 at home with a 2.89 ERA (93.1-IP, 30-ER), which ranked 8th in the AL...on the roadwas 4-6 with a 4.53 ERA (91.1-IP, 46-ER).Compiled a 3.37 ERA in 19 starts after his earlyexit on June 8 at TEX: 7-6, 123.0-IP, 109-H, 50-R, 46-ER, 34-BB, 94-SO, .240 opp avg.Went winless over his last 5 starts, all comingin September (0-2, 4.73 ERA)...received anaverage of 3.13 runs per start in run support,lowest among his rotationmates.Allowed just 2-ER in 38-IP (0.47 ERA) in 5starts against the Blue Jays...compiled ascoreless streak of 25.1-IP vs. the Jays spanning4 starts (July 19-Sep 7)...that's the longestsingle-season scoreless streak againstone club in club history.Exchanged 1-0 decisions with TOR DavidPurcey 12 days apart, on Aug 27 (Garza won)and Sep 7 (Purcey won)...the last time twostarters traded 1-0 games was 1976, whenMIL Bill Travers and NYY Dock Ellis did it.Beat Boston and Tim Wakefield, 3-1 at homeon July 1, the middle game of a 3-gamesweep...7.0-IP, 4-H, 1-R, 0-ER, 0-BB, 3-SO...retired the first 9 men in order and 14 of thefirst 15.Started Sep 17 vs. BOS on three days' rest forthe first time in his career (4.2-IP, 5-H, 3-R/ER), receiving no decision in the 10-3 win...it was the first time a Rays starter pitched onless than four days rest in more than threeyears - since Mark Hendrickson in July 2005.Allowed one run or fewer 11 times.Career is 12-6 with a 3.13 ERA against the ALEast...7-16, 4.66 against the rest of baseball...career 3.13 ERA vs. the East is 3rd among allactive pitchers (min. 20 starts), trailing NYMPedro Martinez and TOR A.J. Burnett.Underwent right foot surgery on Oct 31 to removea small piece of bone from an old fractureon the outside of the foot. Began season at Triple-A Rochester...was 1-1, 2.88 (25.0 ip, 8 er) in first four starts, April 7-May 2...tossed 6-plus innings in nine consecutive starts, May 12-June 21...was 1-2, 1.35 (20.0 ip, 3 er) in three starts, May 22-June 1...recalled June 29...made his first appearance and only relief appearance, tossing 2.0 scoreless innings, July 2 at New York (AL)...made his first start and earned his first win, July 6 at Chicago and tossed 6.0 shutout innings...did not allow a run in his first three appearances (15.0 ip)...struck out a career-high 11 batters in 6.0 innings, July 29 at Cleveland...allowed seven runs on nine hits and lasted just 2.1 innings (his shortest start of the season), August 14 at Seattle...earned first career win at home, snapping a streak of 10 consecutive losses at the Metrodome, September 19 vs. Texas...pitched 6-plus innings in six of 15 starts and 7-plus innings in two starts...had six quality starts. Started the season at Single-A Fort Myers...won his ﬁrst ﬁve decisions from April 6-May 8, including an 8.0 inning four hit, nine strikeoutwin May 8...named the Twins' Minor League Pitcher of the month for April posting a 3-0 record with 0.74 ERA (24.1 ip, 2 er)...earned a promotionto Double-A New Britain May 18 and pitched 7.2 scoreless innings, allowing one hit while striking out a season-high 13 batters...named EasternLeague Pitcher of the Week for the week ending May 21...earned wins in his ﬁrst three decisions from May 18-28...allowed just one earned runin three starts (18.0 ip) from June 4-15...pitched 8.0 shutout innings in back-to-back starts June 30 and July 5...over the two starts he struckout 16 and walked just one...promoted to Triple-A Rochester July 15 and suffered the loss that night as he went 7.0 innings allowing three runson ﬁve hits...won his next three decisions (four starts) from July 20-August 8 and posted a 1.33 ERA (27.0 ip, 4 er)...made his Major Leaguedebut August 11 vs. Toronto, lasted 2.2 innings allowing seven runs on eight hits...he became the fourth fastest player to reach the Majors inTwins history...picked up his ﬁrst Major League victory on August 23 at Baltimore as he pitched 6.0 innings without allowing an earned run...won in back-to-back starts September 19-24...won Jim Rantz Award as Twins' Minor League Pitcher of the Year...named USA Today Minor LeaguePlayer of the Year, becoming the second Twins player in as many years to be named (Francisco Liriano, 2005)...the Twins become just the secondfranchise since the awards inception in 1988, to win the award in two consecutive seasons joining the Atlanta Braves (Andruw Jones in '95 &'96)...rated Best Prospect in Twins Organization, Second Best Prospect in Eastern League, Best Control in Double-A and Best Breaking Pitch in Florida STate League by Baseball America. Transferred from Elizabethton to Beloit July 12...ranked 10th best prospect in Midwest League by Baseball America. 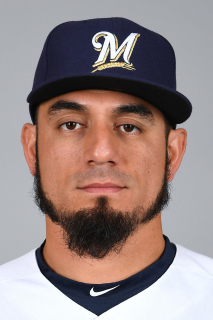 November 2, 2017 RHP Matt Garza elected free agency. August 3, 2017 Milwaukee Brewers activated RHP Matt Garza from the 10-day disabled list. July 26, 2017 Milwaukee Brewers placed RHP Matt Garza on the 10-day disabled list. Right lower leg strain. June 14, 2017 Milwaukee Brewers activated RHP Matt Garza from the 10-day disabled list. June 7, 2017 Milwaukee Brewers placed RHP Matt Garza on the 10-day disabled list retroactive to June 4, 2017. Chest contusion. April 24, 2017 Milwaukee Brewers activated RHP Matt Garza from the 10-day disabled list. April 17, 2017 Milwaukee Brewers sent RHP Matt Garza on a rehab assignment to Wisconsin Timber Rattlers. April 12, 2017 Milwaukee Brewers sent RHP Matt Garza on a rehab assignment to Colorado Springs Sky Sox. March 31, 2017 Milwaukee Brewers placed RHP Matt Garza on the 10-day disabled list. Strained right groin. June 14, 2016 Milwaukee Brewers activated RHP Matt Garza from the 60-day disabled list. May 30, 2016 Milwaukee Brewers sent RHP Matt Garza on a rehab assignment to Wisconsin Timber Rattlers. July 21, 2015 Milwaukee Brewers activated RHP Matt Garza from the 15-day disabled list. September 1, 2014 Milwaukee Brewers activated RHP Matt Garza from the 15-day disabled list. January 26, 2014 Milwaukee Brewers signed free agent RHP Matt Garza. July 23, 2013 Texas Rangers activated RHP Matt Garza. May 21, 2013 Matt Garza roster status changed by Chicago Cubs. May 16, 2013 Tennessee Smokies sent RHP Matt Garza on a rehab assignment to Iowa Cubs. May 11, 2013 Matt Garza roster status changed by Tennessee Smokies. May 6, 2013 Tennessee Smokies sent RHP Matt Garza on a rehab assignment to Iowa Cubs. May 1, 2013 Matt Garza roster status changed by Tennessee Smokies. March 31, 2013 Chicago Cubs placed RHP Matt Garza on the 15-day disabled list retroactive to March 22, 2013. Strained left lat. November 2, 2012 Chicago Cubs activated RHP Matt Garza from the 60-day disabled list. August 21, 2012 Chicago Cubs transferred RHP Matt Garza from the 15-day disabled list to the 60-day disabled list. June 6, 2011 Chicago Cubs activated RHP Matt Garza from the 15-day disabled list. November 28, 2007 RHP Matt Garza roster status changed by Minnesota Twins.